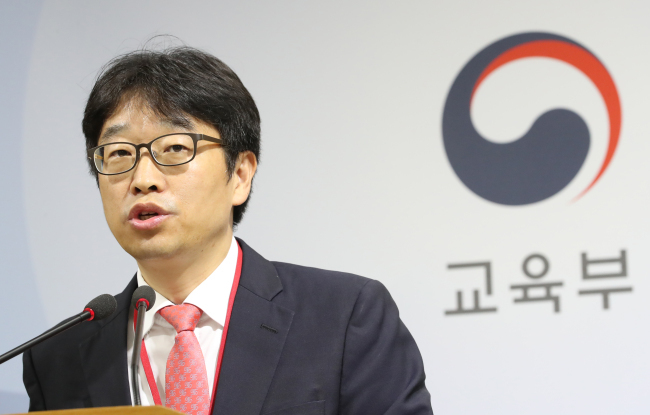 SEJONG -- Labor conditions for about 80,000 part-time lecturers in South Korea are expected to improve as a result of a policy proposal agreed upon Monday by instructors, universities and the government. At a media conference at the Ministry of Education, a consultative panel tasked with improving the treatment of part-time lecturers announced a proposal that would mandate universities to hire part-time lecturers for at least a year and to allow reappointments for up to three years. The panel, made up of 12 people including part-time lecturers and representatives of universities and the government, was created in March to find ways to ensure greater job stability for part-time instructors and visiting and adjunct professors. “Today’s proposal is very meaningful in that it is the first agreement made between the lecturers and the universities, after eight years of disputes,” Lee Yong-woo, the chief of the consultative group, said at the media conference. While there have been ongoing demands concerning labor rights and hiring status for part-timers, discussions often failed to bridge the gaps between the different parties. Earlier revisions to the laws have been passed, but on four occasions since 2012 their enactment was stalled because part-timers and universities could not agree on important details. If passed, the proposed revision would see part-time lecturers reclassified as school personnel, just like other professors. Currently, under the Higher Education Act, school personnel are defined as professors, associate professors, presidents and deans. This leaves out part-time lecturers as well as visiting and adjunct professors. As school personnel, part-time lecturers would be protected from unwarranted dismissal and granted immunity from arrest on their university campuses. They would also be paid for school vacations during their contracted terms and would receive severance pay. When asked how much those changes might cost, Lee estimated that 300 billion won ($269 million) in additional spending would be necessary to implement the changes at about 450 universities throughout the country. Poor labor conditions for part-time lecturers in Korea first came to the public’s attention in Korea in 2010, when a part-timer named Seo Jeong-min took his own life, leaving behind a note about his experiences. The consultative group said it would deliver its proposal to the National Assembly and the Ministry of Education for review and request amendments to the existing laws to reflect their recommendations.